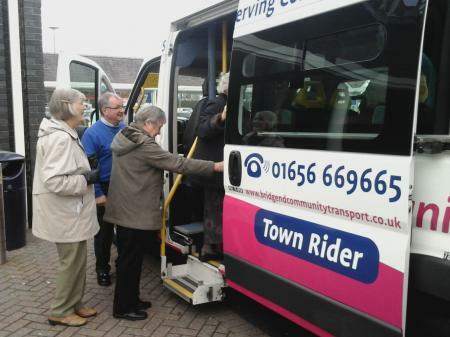 Available between the hours of 08.30 and 16.30, Monday to Friday*, Town Rider is an affordable door-to-door not-for-profit accessible community bus service serving individuals needing to travel within, or between, Bridgend Town wards. 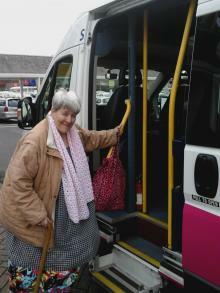 Drivers are on hand to help passengers board and alight vehicles and will even help carry shopping bags to the door. All Wales Concessionary Bus Passes (including companion passes) are accepted on this service. 'Town Rider' operates on a door to door basis. The service is subject to availability and guideline timetables which will vary according to the demand for travel and requested destinations on any given day. Passengers may use the service to access local essential services such as: grocery shops; supermarkets; health and well-being services; and sporting or leisure facilities. Unlike other community transport services or taxis, passengers booking the service will not have exclusive use of the bus and will likely be sharing the vehicle with other pre-booked passengers who are travelling to the same or nearby destination. Fares for travel on the Town Rider service are charged at a fixed fare. Bus pass holders travel free of charge under the All Wales Concessionary fare scheme operated by Welsh Government, provided a valid pass is presented by passengers boarding the vehicle. All other passengers will be required to pay a fare. Typically, an Adult single fare is £3.65 and an Adult return fares is £5.00**. Bus fares on this service are collected directly from passengers by the driver. Passengers need to register to use the Town Rider service. There is no joining fee. ** Fares are correct as at time of print and are subject to change. Notices of any proposed increases will be displayed on 'Town Rider' vehicles a minimum of one month prior to increase.